University Project: Interactive 3D environment created using Direct3D and C++. Very open brief allowing students to design their own environments as long as they were relatively large in scale, populated with both dynamic and static objects, allowed first/third person navigation, and contained interactive elements. Appropriate rendering techniques were implemented based on the environment chosen. Pair project, expansion on rendering engine created for Lights and Shadows project. Our environment: Terrain begins desert and barren, but completing a block puzzle in the centre of the scene causes rain to fall. 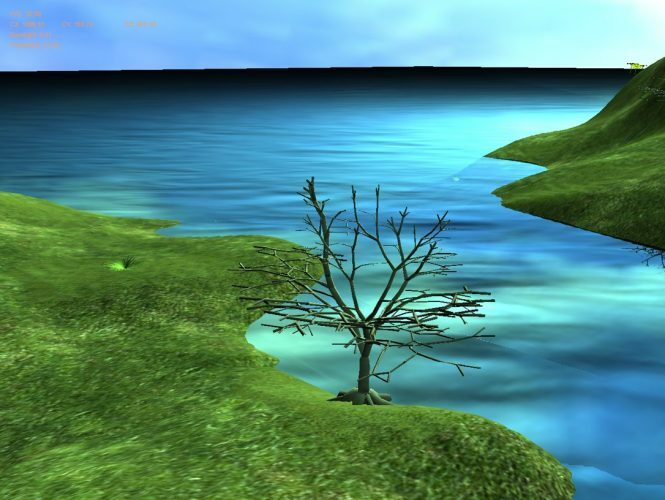 The terrain then becomes grassy, water level rises and plants grow. Tap on image to read feature description. Click on image to read feature description. REFRACTION: Texture created based on camera’s position and view of everything below the water. Everything above the water is clipped. Refraction and Reflection textures combined, based on Fresnel calculation with camera’s height. REFLECTION: …Sampled based on position in relation to camera when rendering the water/mirror. BILL BOARDING: Rain texture is applied to a billboard which constantly updates its position/rotation based on the position and orientation of the camera. Alpha blending used to enable transparency. COLLISION AND OBJECT INTERACTION: Collision spheres used for block/camera and block/block collision. To push a block, direction is determined based on position of camera in relation to block, and then block is translated accordingly. Day/Night cycle achieved by lerping between two different sky dome textures. Barren/Lush transformation achieved in the same way. TERRAIN GENERATION: …Camera height based on corresponding height map value when traversing the map in first person view. BUMP MAPPING: …This is tiled in order to avoid stretch. BUMP MAPPING: On the water, two bump maps are applied, tiled and translated differently to create a ripple effect. Tree growth simulated by gradually increasing the number of indices rendered for each. Each tree is assigned a different random growth speed. Fish under water glow at night. Faked: Diffuse value altered based on time of day.